Why do we do the things we do? Why do we put ourselves in a position of saving as much as we can and living life when we retire? Today I have a very special guest. 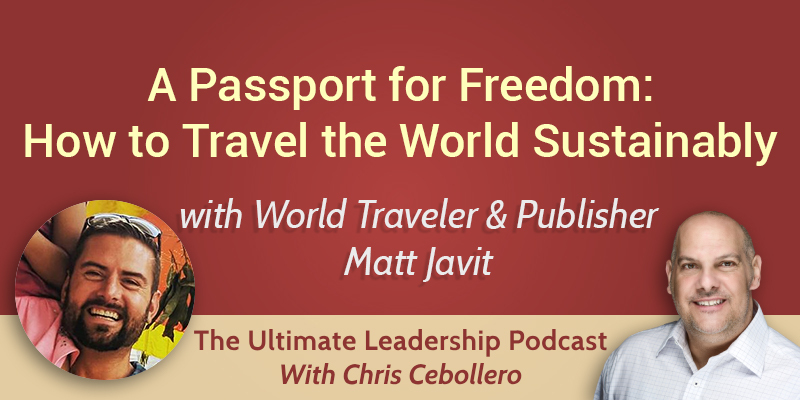 Meet Matt Javit, a world traveler and a blogger, here to change the way you think about your life. Matt was working consistent 60-hour weeks for an international IT services company. He worked really hard and had a lot of success. He believes that if you have skills that are valuable in the market and you continue to improve every day, there is always going to be a role for you to produce in some capacity. If you’re always trying to get better, you’ll have opportunities at your door when you decide to bring in more income. Together with his wife, Matt took the leap of faith and went on an amazing journey traveling the world. They knew that there were a lot of risks involved but they felt that the rewards were ultimately greater than the risks. Before they left for their travels, they made sure to leave everything in order. They both realized that they didn’t need many of the things they thought they needed. It was extremely freeing. We live in a time where it’s never been easier to attempt to do what Matt and his wife are doing. They’ve leveraged technology in the greatest way. They are taking full advantage of everything that’s out there in order to keep their costs down but also keep their cultural experiences at the highest level. Their travels have changed their philosophies on so many levels. Matt and his wife were pleasantly surprised to see that the English language is used in many parts of the world. Even when someone didn’t speak English, they could still understand each other using sign language or Google Translate. Overall people wanted to do them right. Matt feels that the world is extremely kind and inviting. He believes that what he is doing is going to become a lot more common in the future.